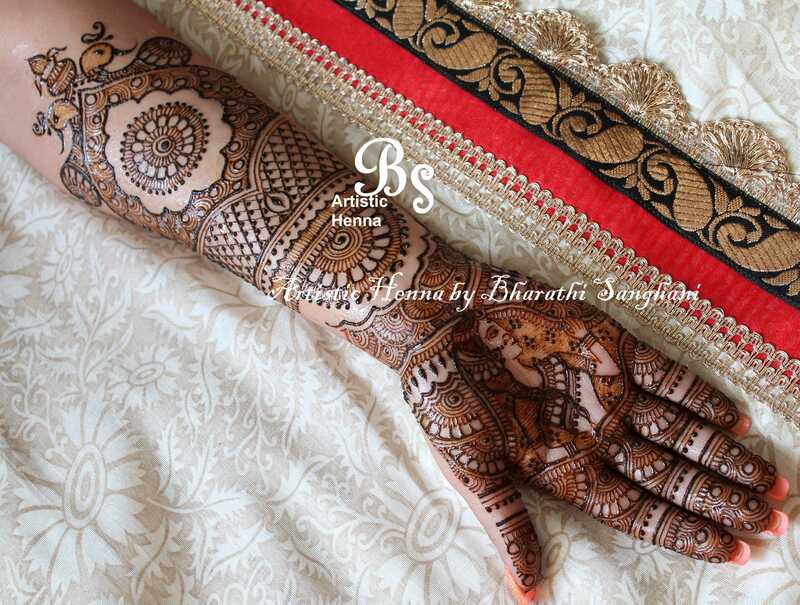 I am happy to present to you Bharathi Sanghani from Derby, UK and her stunningly beautiful mehendi designs. 1. Tell us about yourself – when did you begin applying mehandi and how did u think of getting into this line? I started from a very young age in India. As far as I remember, I always loved henna-ing. I just loved making up my own mehandi designs. Always a lover of art, I spent most of my time drawing & sketching. About 10 years ago, I started applying mehandi professionally at events/gigs purely out of my love for the art. With a lot of encouragement from friends & other artists, I eventually started applying bridal mehandi and have never looked back. Expressing my creativity through bridal mehandi designs is my passion – I have loved every moment of my journey! 2. What are your top favorite mehndi designs? I love seeing all the different mehandi styles, and don’t really have a personal favorite. However, for me, most of my work has been along the lines of traditional henna. I enjoy doing figure work – bride & groom designs especially. This is becoming increasingly popular in the UK, with more brides coming to me for the intricate traditional Rajasthani style mehandi designs. 3. Most memorable experience you had while doing mehandi designs – something that has stayed close to your heart and is remembered very fondly? For me, the beauty & joy of henna lies in how it brings people together and allows a special bond to be formed with the brides, many of whom have gone on to become good friends. I remember virtually every bridal mehandi that I have done because each one was special for the bride and for me. Something that stays very close to my heart is the time I spend at a well-known children’s charity in the UK every year. Reaching out with mehandi to the disabled children, young refugees, children at risk on the streets and seeing the pure joy on their faces when they have a free-hand mehandi designs/tattoo is the real henna-connection, the henna bond we form wherever we go. 4. What are the most important tips to take care of henna design after applied? First of all, use only good quality natural henna and avoid products that give instant color. For best results, remember to simply pick/scrape off your henna and avoid water over the next 24 hours, as far as possible. It’s always advisable to have the mehandi designs applied 2 days before the big day, as natural henna needs 2 days to develop from an orange-ish red to a cherry brown. Above all, remember to keep warm as that will help deepen the color. 5. What are the mehandi designs that are in trend this season? Every bride wants a unique experience, something just for them. That is what I try to achieve, from the initial consultation to the big day. For me the trend is always traditional as that’s what the brides come to me for. Incorporating peacocks, mandalas, kalash, shehnai, doli, dulha, dulhan designs into my style of doing mehandi, I give them the mehandi designs they will cherish & remember for years to come. 6. What is the best way to reach you? Take a sneak peek at my work on my website or follow my latest work on Facebook. 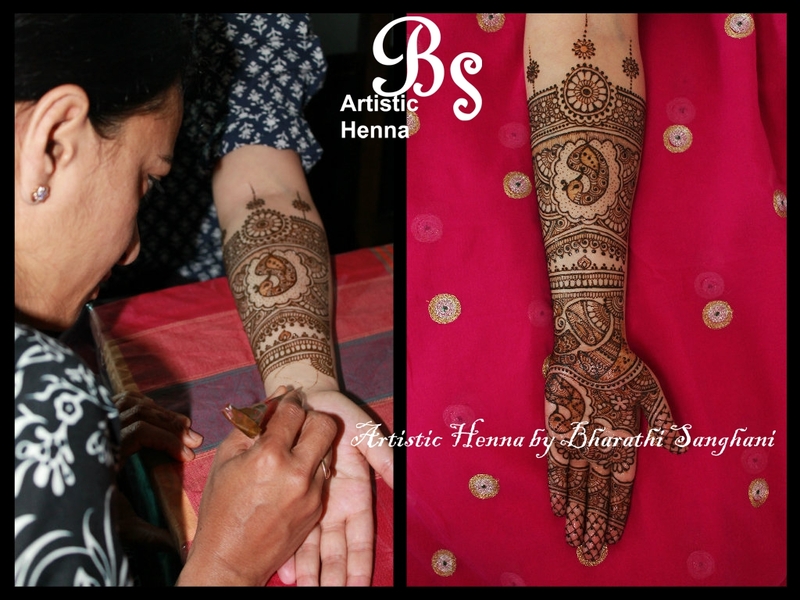 Enjoy mehandi designs by Bharathi Sanghani. (Published with permission of Artistic Henna. Please don’t use these images without permission from the original source). March 18, 2014 in Mehandi Designs.